The 2310 is a standard model flugelhorn which features many of the same specifications as our pro models, and delivers a traditional flugelhorn sound-extremely round and mellow- with accurate intonation and easy playability. It is available in either lacquer or silver-plate finishes. This style of valve tubing eases the transition for doublers by making the instrument feel similar to a trumpet. The precise fit between casings and pistons after honing means no air leakage. Perfectly rounded tubing results in less turbulene and a smoother air flow, thus allowing for an excellent scale and reduced resistance. 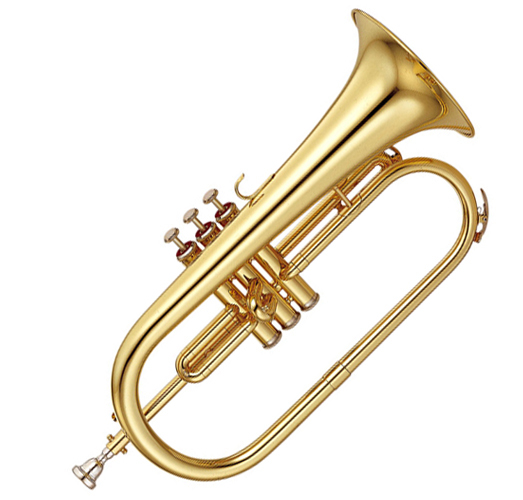 The YFH-2310 flugelhorn is available with a silver-plated finish (YFH-2310S). YAC FH7F4 Flugelhorn mouthpiece; allows for mellow soft tone in higher register. YAC FH16F4 Flugelhorn mouthpiece; good for orchestral players who like large sound.